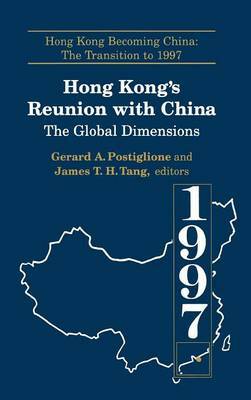 The issues surrounding Hong Kong's global position and international links grow increasingly complex by the day as the process of Hong Kong's transformation from a British colony to a Chinese Special Administration Region unfolds. This volume addresses a number of questions relating to this process. How international is Hong Kong? What are its global and international dimensions? How important are these dimensions to its continued success? How will these dimensions change, especially beyond the sphere of economics? Is Hong Kong's internationalization, defined in terms of its willingness to embrace international values and its capacity to maintain its international presence, at risk? These questions are presented as they pertain to the changing situation; relations between mainland China, Taiwan and Hong Kong; the positions of Australia, Canada and the United States on Hong Kong; internalization of international legal values; Americanization vs. Asianization; linkages to the world through Guangdong; strategies to emigrate overseas, cultural internationalization; media internationalization and universities within the global economy.